Data Source plug-ins are components of the program that contain instructions on how to retrieve information from different sources of data, and how to store it back. For example, a database plug-in may use the SELECT statement to back up tables, and CREATE-INSERT statements to restore them. Storage plug-ins are components of the software that provide one-to-one mapping to different file systems. They can be used as a source of data, as a target destination for backups, or provide folders for synchronization. Note: In our software, the term "plug-in" is used to refer to a certain type of features that can be updated independently from the program’s core. These features are not "minor" or "supplementary" in any way. Plug-ins are used for all operations: for example, copying of local HDD files relies on the Computer plug-in. To learn more about the concept of plug-ins, see Plug-ins. Each plug-in creates a virtual file system with hierarchical structure. Files and folders of the file system correspond to objects of the respective data source: for example, files of the Disk Image plug-in are used to access HDD partitions. 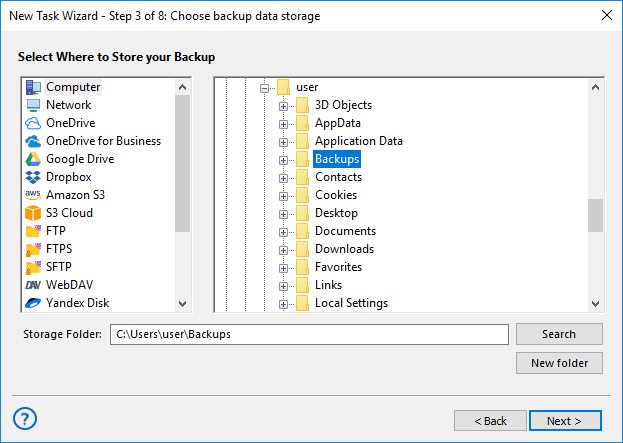 When the program runs backup, restore or synchronization, it works with objects provided by plug-ins as if they were common files and folders. You can learn more about virtual file systems in Plug-in File Systems. Data source plug-ins provide access to local PC objects. You can see all plug-ins on the second step of the New Task Wizard, in the Data Sources pane to the left. Storage destination plug-ins provide one-to-one mapping to storage file systems (e.g. local HDD, or remote FTP location). You can see all storage plug-ins on the third step of the New Task Wizard, in the Storage Destinations pane to the left. Both types of plug-ins can be used as a source of data. You can see a full list of plug-ins in the table below. Plug-in Type Edition 32-bit/64-bit? User-specific? 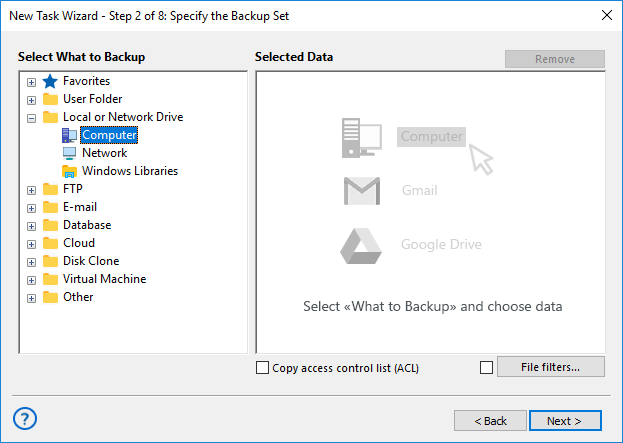 *To use the Disk Image plug-in and to back up open files with the Computer plug-in, Workstation must be launched from a user account with administrator privileges, and you need to have a running Volume Shadow Copy Service. Without the service, the Computer plug-in will not be able to copy files that are opened by other applications. **Workstation must be launched from a user account with administrator privileges, and you need to have running Volume Shadow Copy Service and SQL Writer Service (for the MSSQL plug-in) or Exchange Writer Service (for the MS Exchange plug-in). Note: The above information may change from the time of publication (version 8, Fabruary 2019). You can learn more about data source plug-ins in the next chapters.